A real must visit for a fantastic New Years celebration and especially in Edinburgh that hosts celebrations and events all through the night and is one of the best events in the world. However, you could easily visit anywhere in Scotland for a fantastic New Years celebration with fireworks and whisky galore. Stay in a funky Scottish hotel near to St. Andrews celebrations? 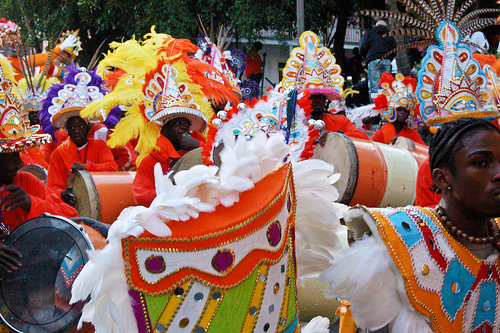 Throughout the whole of the Bahamas (and some cities in the USA) there are grand parades through the streets on these dates to celebrate and remember the days around Christmas time, during the slavery years in the Bahamas, in which they were allowed to leave the plantations and be with their families. 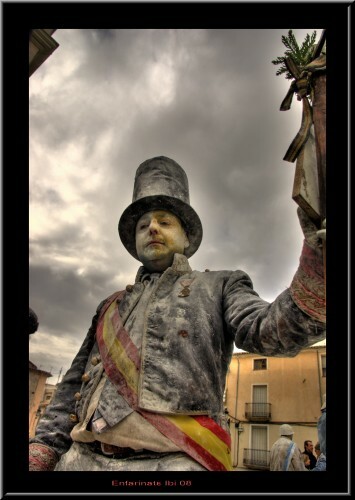 This celebration stuck through the generations and is now an organised event with themes, costumes and parades. The most spectacular parades are in Nassau and have two categories: for major competitors and for fun groups. Stay in an undersea lodge, not on the islands of the Bahamas, but a short flight away? 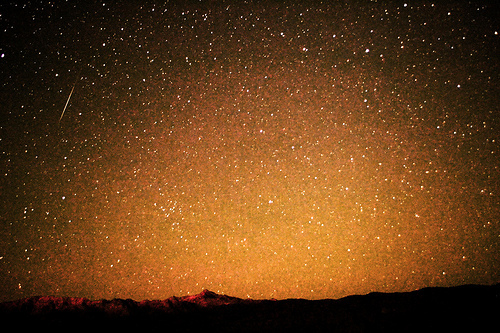 Often the last meteor shower of the year with around 50 meteors visible every hour and is therefore one of the most prolific meteor showers in the world. For Geminids (or any meteors) you really want someone with you to 'help' on the lookout and somewhere away from light pollution. A great thing about Geminids is that you can start watching at around 10pm local time (much earlier than most showers) and peaks around 2am. To fully enhance this experience, it's best to stay in a remote hotel like: Hatari Lodge, Indigo Patagonia, Snowdonia Manor or even Montes Ferreiros. Or click here for a full list of secluded hotels. In Berlin, there is the Lucia Christmas Market, which is held in the two Kulturbrauerei courtyards in the Prenzlauer Berg district. Open from late November to a few days before Christmas, you can enjoy hot mulled wine while shopping for handmade presents in a very family-friendly environment. Check out nearby hotels here. In Dresden, there are three markets to visit during the Christmas period. There is the Medieval Christmas Market in Dresden Castle's courtyard, open from 29th November this year until 23rd December, then again from 27th to 30th December. For traditional, handmade gifts, you can visit the Frauenkirche Christmas market between 30th November and 24th December. Then there is the centuries old Striezelmarkt, in its 578th year in 2012. This market can be visited from 28th November to 24th December. There are several markets in Prague during the Christmas season, bringing brightness and a cheerful atmosphere across the city from the start of December all the way through to the first week of January: ending on the sixth day of the New Year. For further info, click here, or for nearby Unusual Hotels to stay in while you visit the Czech Republic, click here. Other markets to note are held in Brussels, Lille, Cologne, Bruges, Montreux, Graz, Belfast, Budapest and Barcelona: just a few examples of the many markets right across Europe at this time of year. If you're shopping in the markets in Catalonia, keep your eyes peeled for the naughty caganers - a local traditional figurine that is often placed in the background of a nativity scene for good luck - depicting people crouched down for defecation. 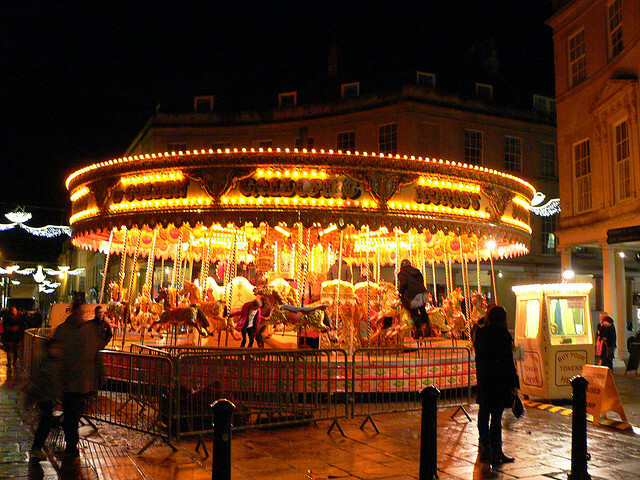 Each year, the beautiful area between the stunning Bath Abbey and the internationally renowned visitor attraction, the Roman Baths, is transformed into a Christmas shopper's haven - the Bath Christmas Market. 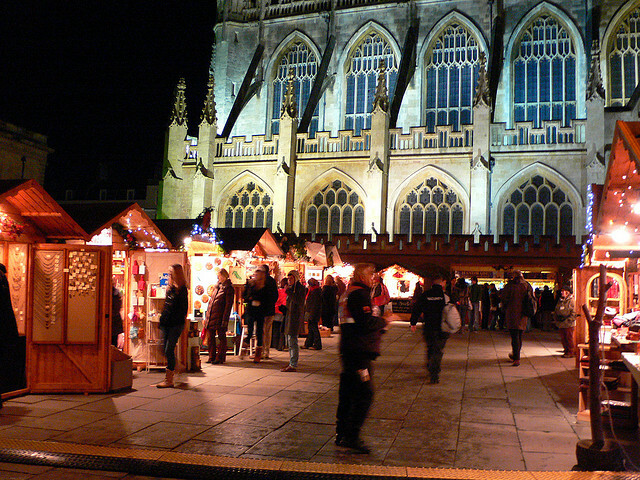 In the heart of Bath's main shopping district, 129 traditional wooden chalets adorn the streets; each one offering unique, handmade and unusual gifts, decorations and food items - everything you will need for the perfect Christmas celebration. If you're planning to visit Bath, stay in one of the Cru houseboats, located right in the centre of town. Sleeping four to six people in two double bed cabins and two single sofa beds, they’re a fantastic alternative to families and small groups visiting Historic Bath for a minimum of 2 nights. With log fires and full central heating, they're cosy and fun. Almost an equivalent of April Fool's Day (known as Santos Inocentes), but with a twist. A group called Els Enfarinats take the city under the slogan 'New Justice' and it's after this that the 'Race for Mayor' takes place, in which it is voted upon who shall become mayor of Els Enfarinats and then who will go to jail for not paying the fine. A very strange festival in which a town is actually taken over for a day by essentially a group of pranksters and has been happening for over 200 years. At the end of each day there are fireworks and flour fights (obviously) and a great bit of fun for anyone. For a bit more depth to this click here. Sinterklaas (or as we know him, Saint Nicholas) is the patron saint of Amsterdam. On the night of the 5th of December (and the following morning), Sinterklaas bestows gifts to children in the city. He is a more distinguished version than, and is cited as the inspiration for, the modern Santa Claus, outfitted in attire more appropriate for a saint. Why not stay in an unusual hotel in the city? The Dresden Stollen is a traditional Christmas cake, dating back to the 15th Century. The residents of Dresden now celebrate this with an annual festival. A gigantic Stollen, three or four tons in weight, is baked for this festival, and cut in a ceremony using a 1.2-metre-long knife. Why not check out some nearby hotels? The Serpentine Lake in Hyde Park is home to the Peter Pan Cup swimming race, where over 40 members of the Serpentine Swimming Club race through the freezing waters of the lake at 9 o'clock on Christmas morning. If you're not still lazing in a warm bed, you can watch this tradition that dates back to 1864 (though the Peter Pan Cup part was not introduced until 1903). Why not visit the Basilica di San Nicola in Bari, Italy? This spectacular church, almost a millenium old, contains remains and relics of Saint Nicholas (and was built specifically for that purpose). The German Museum of Technology can be an exciting place to visit for all ages; even the exterior is eye-catching, with an aeroplane overhanging the roof at the front. Located in the Kreuzberg district of Berlin, you can find out more information about the museum here. Faro in Portugal has some spectacular Christmas decorations and lights, including a giant silver Christmas tree, from 8th December onwards, which is when they start their festive celebrations. Christmas Eve is traditionally celebrated with a meal of salted cod (locally known as "bacalhau"), and the New Year is brought in with fireworks and concerts. The Capela dos Ossos (Chapel of Bones) in Evora, Portugal is a slightly chilling place to visit: the chapel's walls are lined with human bones and skulls. Culatra is a place to visit if you want some isolation from modern civilisation. It can be reached by ferry from Olhao, and there are no cars or roads, and few humans at all. The Liseberg amusement park in Gothenburg, Sweden celebrates Christmas every year with traditional Swedish food, beverages and other Christmas-themed festivities. It's open from mid-November until 23rd December. Ljubljana Castle provides amazing views of the city of Ljubljana in Slovenia. It can be accessed by foot, car, tourist train or funicular. The castle is also a great place to visit in the Summer months, when you can be given a guided tour of the place. The Australian Summer (December to February) is a fantastic time to visit the isolated and varied scenery of Tasmania, as the countryside is most impressive at this time of year. While visiting Tasmania, why not stay in an art hotel that used to be a jam factory? Converted railway carriage close to St Andrews for golf. Formerly the home of a clergyman, this 19C Scottish Manse is now an art gallery that provides Bed and Breakfast accommodation.